Taskworld is a cloud-based project and task management solution which combines visual task boards, project analytics, burnup and burndown charts, in-app group and private messaging, and more. Native apps for iOS and Android allow users to receive real-time notifications, access shared files, and collaborate with their team no matter where they are. With Taskworld, users can create and manage projects, and utilize task lists or Kanban boards to manage workflows according to their preferences. Tasks can be dragged-and-dropped into lists, assigned to team members, set due dates, and have tags and labels added. Recurring tasks can be set to repeat daily, weekly, monthly, or yearly, removing the need for users to continually create repetitive tasks from scratch, and projects can also be copied or created from templates. Individual tasks can also be linked to multiple projects, allowing users to update the same task across multiple project locations in a single step. Tasks can be assigned a number of points based on their difficulty, and then be organized according to their relative scores. Users can also comment directly on tasks to keep team members updated on progress or issues. Taskworld includes built-in chat functionality, allowing users to send direct messages to one another. Public channels can be used to send messages to the whole organization, or users can create private groups or individual chats to communicate with selected team members. Files can be uploaded into Taskworld to share with team members using the drag-and-drop upload, and can also be dropped directly into messages to be sent as attachments, with image previews immediately displayed to users. Users can also send and reply to chat messages from within their email inbox, as well as receive notifications by email. 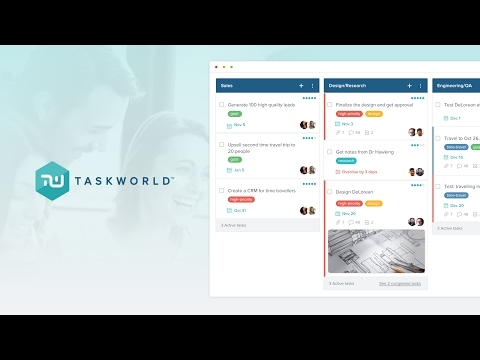 Taskworld’s dashboards give users an overview of projects, with the ability to filter tasks by due date, status, assigned team member, and more. All scheduled tasks are displayed in an interactive calendar, and project progress can also be visualized on a timeline, burnup charts, or burndown charts. Project health status can also be tracked through the tasklist overview, which informs users of which tasks are planned, completed, overdue, or which have no due date. Everyone, even those who are disorganized and generally resist this type of discipline was able to get on board and get up to speed right away - and I mean immediately. So that was great! Right now - the team likes it more than I do in the CEO/COO role - but it is a great fit for the right useage. Control your expectation level: If you want it up and running now - no learning curve - got to have this. If you value simplicity and a few features over tons of options - this is your best choice. If you are a solopreneur or a smaller business, and want to keep track of several (or lots) of projects and be able to very simply choose who gets access to what files and lists, this is it. If you set it up to remind you about everything you've input - it will surely do that - this system will remind the hell out of you! It's like anything else - you have to commit to it's use and any applicable team members for it to work. This is also a GREAT system to BEGIN with if you're not sure what you should be doing, keeping track of, and so forth. If you are the overarching control manager freak type who wants to know every second who is doing what - what is coming in, and going out - how much it's costing - chances of closing sales, and so forth - this system is NOT for you. Bottom line - It delivers way more than it costs - and for beginners - is the system to start with. Disclaimer is - if you have a LOT of users - it can get more expensive - but all of these SaaS are designed that same way. NOTE: We are a direct sales B2B company with lots of Reps and lots of creatives fulfilling on SMS, websites desktop and mobile menu driven, SEO, press releases, book editing, formatting and publication. Intuitive-this system is very simple to learn and use. Basic stream lined design, just like using a file cabinet. Would definitely suggest this to those who need a system with JUST the basics - and don't want to be overwhelmed with a ridiculous learning curve. Customer service is great and responsive and personable, which in this day and age is always a very big surprise and great selling point. Totally inexpensive - for mid-range features. Intuitive-this system is very simple to learn and use. Basic stream lined design, just like using a file cabinet. Would definitely suggest this to those who need a system with JUST the basics - and don't want to be overwhelmed with a ridiculous learning curve. Customer service is great and responsive and personable, which in this day and age is always a very big surprise and great selling point. Totally inexpensive - for mid-range features. What they have going for them - is also what they lack. It is very intuitive, because it is very basic. There's not much you can do with it other than make and organize lists, tasks, assign tasks, etc. And if that is what you're looking for - this is probably the best choice. If you are a project manager working with the "creatives," who are fantastic - but not always very organized - or if YOU struggle with being organized, this system deserves the free trial. Bests Trello and many others - but it's NOT a pipeline for you SALES MANAGERS! If you want a sales pipeline - you can strategically get creative with it - but it is not designed for it. We've been using it for about a year, on and off, and are not 100% satisfied. Perhaps a few more options and features would be nice - but the more you build in, the more time it takes to learn it. So it's Pro is also it's Con. Our company is so much more organized now. We've been able to consolidate down from 4-5 different products down to this one task management platform. There's a lot more visibility all across the board, too, and fewer inner-office emails.-I love the visibility/oversight that TW gives you'we currently have about 50 'public' projects in TW, and management can quickly hop around and get an instant snapshot of how each project is progressing. -I love how it's a one-stop shop of information/communication. It's got conversation channels, tasks, personal to-do lists, time tracking, analytics, scheduling... we were able to consolidate 4 or 5 different platforms into just the one. -It's intuitive. Training roughly 40 new users on it at once was fairly straightforward, as the steps required in using TW are pretty clear. The basic functionality is easy to pick up on, leaving most of the training energy focused on hammering down specific protocols for how WE will use TW, and showing exciting, fun TaskWorld abilities and tidbits. -While the labels and points systems may be helpful for many, I really like the tags. The bold colors and easy-to-search tag titles provide important information on any task without having to even open it up. -The overview'oh my goodness! You can search almost any conceivable permutation of filters, quickly narrowing down to the pertinent info you're seeking. -I love how tasks can live in multiple projects'so a task can appear in its designated slot within a public project, but can also exist in my own personal Weekly To-Do project. No duplication of effort! -They seem really open to user suggestions'our rep has been quite responsive to my questions and requests. -I love the visibility/oversight that TW gives you'we currently have about 50 'public' projects in TW, and management can quickly hop around and get an instant snapshot of how each project is progressing. -I love how it's a one-stop shop of information/communication. It's got conversation channels, tasks, personal to-do lists, time tracking, analytics, scheduling... we were able to consolidate 4 or 5 different platforms into just the one. -It's intuitive. Training roughly 40 new users on it at once was fairly straightforward, as the steps required in using TW are pretty clear. The basic functionality is easy to pick up on, leaving most of the training energy focused on hammering down specific protocols for how WE will use TW, and showing exciting, fun TaskWorld abilities and tidbits. -While the labels and points systems may be helpful for many, I really like the tags. The bold colors and easy-to-search tag titles provide important information on any task without having to even open it up. -The overview'oh my goodness! You can search almost any conceivable permutation of filters, quickly narrowing down to the pertinent info you're seeking. -I love how tasks can live in multiple projects'so a task can appear in its designated slot within a public project, but can also exist in my own personal Weekly To-Do project. No duplication of effort! -They seem really open to user suggestions'our rep has been quite responsive to my questions and requests. -It needs to better integrate googledocs (a feature I've been told they're currently working on). Right now private company GoogleDocs don't display titles, and so are impossible to search within the project. -Overall, it could have more comprehensive search ability (particularly in chats and comments). I love how I can search Workspace-wide OR just within one project, but I'd like to be able to type in a keyword that might only appear in a chat window or a comments section and have it found for me. -If you're involved in multiple projects within a workspace, the notifications can get overwhelming. It'd be nice if 'mark as unread' was an option, so that I could use that notification section as a reminder. It's also a bit annoying that you get multiple notifications back-to-back that are dealing with the same task (A notification when it's been assigned, when a due date has been assigned, if someone has commented on it, if they moved its location, etc... all on top of one another). -TaskWorld could potentially have more customization options (Adding pictures to projects or group chat channels, etc. Though they did just allow for customized backgrounds, and it sounds like they're working on adding more tag and label colors). Wow this review is feedback gold mine for us Lawrence! Thank you so much. Our entire team really appreciates it. I am happy to say that a lot of your feature requests are part of our road map such as: time tracking, guest feature, drag & drop on mobile. My first project management system was Trello because of a recommendation from our VP of Technology. However, at the time, Trello really fell short with its ability to send me proactive alerts and deadline notifications. Taskworld is a real blessing! Not only does Taskworld have flexible deadline options, I can also subscribe to my Taskworld calendar using my company's email system. If that wasn't enough, I get a daily "Morning Digest" that shows me the tasks that are overdue, or due today. The overview and timeline view really give me the big picture so I can track all my department's projects and tasks in one place. The team at Taskworld is extremely responsive and open to new ideas. I have nothing but good things to say about Taskworld. In fact, I now can't imagine managing my schedule without it! It would be a great help for our Task management and Workflow Management.The interface. All information are grouped in one place. It's organize and detailed. I also love the chat feature where you can directly message a member of the team. And a direct feedback to the employee for his/her accomplishments in the project assigned to him/her. Tasks can be linked to multiple project locations, allowing users to update multiple projects at once rather than creating several copies of a single task and updating them individually. Task points can be used to organize tasks based on difficulty, allowing users to manage and balance their daily workloads. Project analytics give users an overview of planned, completed, and overdue tasks, burndown charts showing remaining work, and burnup charts to display the project scope and completed tasks. Built-in chat allows users to send messages directly to one another, individually or in groups, with the ability to attach and share files. Users can receive notifications and updates via email, reply to messages, and create tasks directly from within their inbox. Below are some frequently asked questions for Taskworld. Q. What type of pricing plans does Taskworld offer? Q. Who are the typical users of Taskworld? Q. What languages does Taskworld support? Q. Does Taskworld support mobile devices? Q. Does Taskworld offer an API? Yes, Taskworld has an API available for use. Q. What other apps does Taskworld integrate with? Q. What level of support does Taskworld offer?